USC Leonard Davis School of Gerontology supporter and Board of Councilors member Keith Renken’s story is a classic rags-to-riches tale, but the successful businessman and generous philanthropist is far too humble to ever admit it. Born in the small town of Le Mars, Iowa, he spent his childhood learning the meaning of hard work on his family’s farm and attended a rural school with only nine other students. Money was tight back then, and sharing hand-me-down shoes amongst his five siblings was simply sensible living. “Even if you had a good crop, it didn’t mean you had a lot of money in the bank,” Renken says. In high school, where his father worked as a janitor, Renken developed a love for playing sports (especially basketball), something that would pay off in the form of an athletic scholarship to the University of Arizona. Although he had plans of pursuing a career in coaching/teaching, an accounting class piqued his interest and he ended up graduating with a Bachelor of Science, Business Administration degree in 1957 and his master’s in 1959. Renken also served active duty in the United States Army from 1958-1959 and in the reserves for an additional five years. After graduation, Renken was hired at Deloitte & Touche as an accountant and moved to Los Angeles, where he worked his way up to managing partner of Los Angeles and the Southwest region before retiring in 1992. Never one to sit back and relax, he decided to go after his previous goal of teaching and became an executive in residence in the graduate program at the USC Leventhal School of Accounting from 1992 to 2006. Over the years, as Renken’s career gained momentum, so did his calling to give back to the community, including to students. The USC Leonard Davis School of Gerontology has been a recipient of his support through the establishment of a scholarship fund, the Renken Family Scholarship, as well as his leadership as former chair of the school’s Board of Councilors. 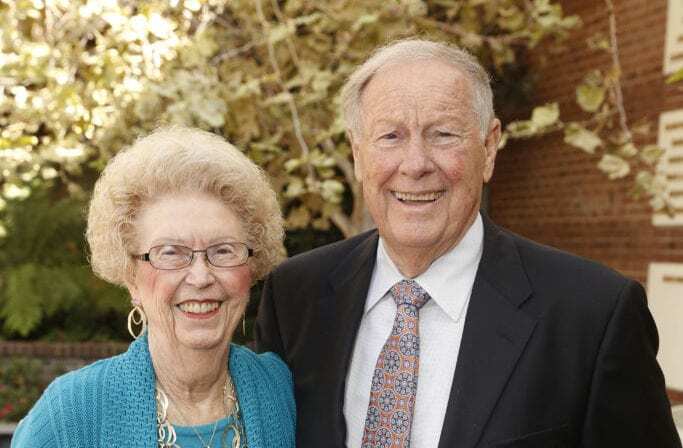 The AS&F Foundation recently donated an additional $1 million to the Renken Family Scholarship to further support gerontology students and recognize Renken’s contributions to the USC Leonard Davis School. Renken also serves on the boards of Unihealth Foundation, Annenberg Foundation, the Whittier Trust Foundations, Autry Museum, Children’s Bureau of Los Angeles, and California Science Center, to name a few. Sharing Renken’s charitable nature, his wife of 53 years, Joanie, took a special interest in assisting young people through her volunteer work with Friends of Foster Children. “A half dozen of those kids are now in their thirties and forties and she still keeps track of them,” he says. Renken has come a long way from his time on the farm wearing his older brothers’ shoes. His family has grown to include five children and 16 grandchildren, and he has never lost sight of helping others. For Renken, it’s just something that comes naturally. Above: Keith Renken and his wife, Joanie (photo by Steve Cohn).